For dormakaba, BIM means more than merely downloading 3D objects in different graphical formats. For us, BIM means in the first instance supporting our customers by providing up-to-date, reliable and precise product data for the planning, construction and management of buildings. In addition to BIM objects representing individual dormakaba products, we are also focusing on providing solutions and services encompassing the entire issue of integrated planning and construction. The complexity of the objects will depend on the application: from simple, parametrizable models with a low functional scope, such as our TS 93 door closers or BTS 80 floor springs, to highly configurable objects such as our HSW partition wall systems or the KTV 3/4 revolving doors. 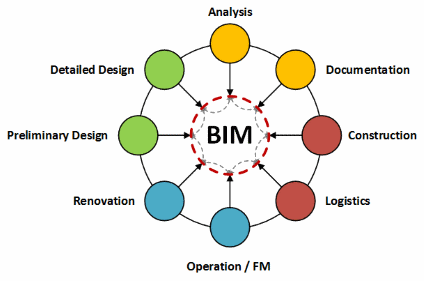 Each BIM object has been especially developed to fit the needs of a particular planning phase. In addition to BIM objects about dormakaba products, we are also focusing on providing solutions and services encompassing the entire issue of integrated planning and construction. Based on our BIM objects, we have developed BIM door solutions that can be used to resolve standard situations at the planning stage. These door solutions contain all the components necessary to meet a door specification, whether in terms of barrier-free access, fire protection or as an emergency exit. The BIM objects are provided with all the properties and functions to satisfy the specified purpose. The core elements of our BIM service range are tailored BIM objects covering the entire dormakaba product portfolio. In creating these objects, particular attention was given to ensuring simple, uncomplicated application and keeping them as light as possible. Where possible, graphical extras have been avoided, with the technical features and functions being placed at the fore. The models have largely been developed and implemented for Autodesk Revit (.rfa). For selected products, we also offer objects for Graphisoft ArchiCAD and in the manufacturer-neutral IFC format.